The Multi-Line Spyder pump can be installed in various applications ranging from transport tractors and trailers, to skid steer loaders and mini-excavators and stationary equipment. Utilizing the suitable size and style of tubing, this system is capable of handling a wide range of lubricants from NLGI Grade EP-0 through EP-2. 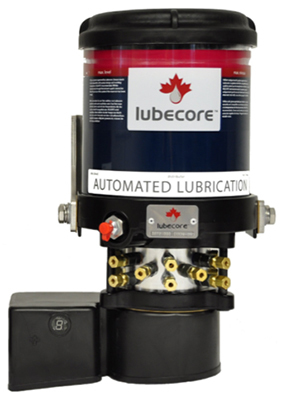 There are seven elements to choose from to match the lubrication requirements of your machines. They range in output from 0.01cc/stroke to 0.12cc/stroke. This customizable compact system provides generous benefits such as improved component life and reduced downtime. Compact integrated pump and output elements keep installation simple and tidy. Optimum corrosion protection due to material choices, corrosion protection process, and installation techniques. Brass, aluminum, and plated steel components ensure long-life in corrosive environments. Integrated timer is simple to adjust for a wide range of applications, and can be externally activated by a magnet to commence a single pump cycle. Solid steel pump cam provides durability to maximize your investment. Maximum of 24 lubrication points.